Vicki Yost as Detroit Police Inspector. and DPD’s liaison to the USDOJ under the former consent decree. Lamar Grable, 20, “executed” by Detroit killer cop Eugene Brown, with his partner Yost, 1996. Update: Inkster officials held a press conference March 26 asking for patience during the investigation of this near-fatal beating. What is there to investigate? They have the videotape. Please note Inkster police chief Vicki Yost’s past role on the Detroit police force, and the fact that she lied about immediately inviting the MSP in as indicated in the story below. She had to have known about Robocop Melendez’ vicious past on the DPD since she was there in an executive position when he and other Detroit cops were tried by the feds in 2004. Justice delayed is justice denied. It’s the same old story. Since the beginning of this year, 200 people across the U.S. have been killed by police, and not ONE cop involved in the killings of Michael Brown and dozens of others has gone to jail. 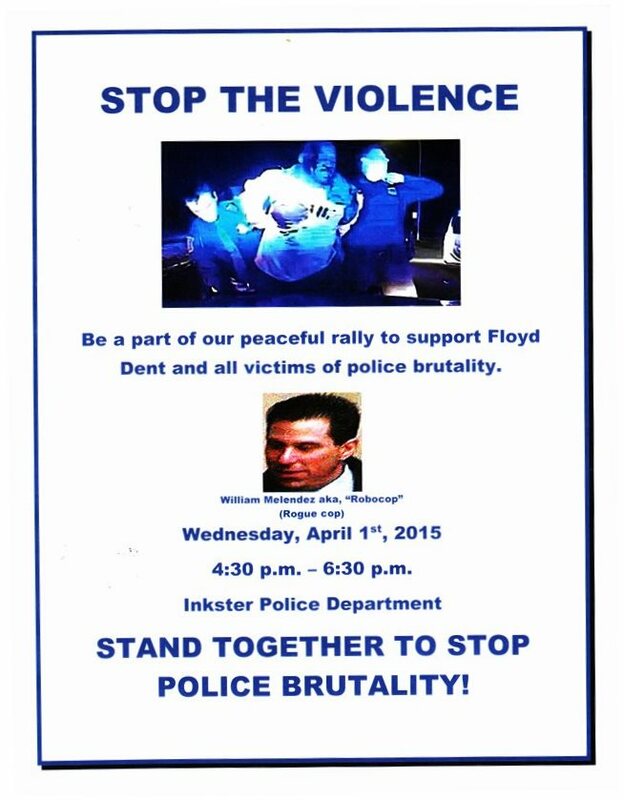 For account of Inkster officials’ press conference, read http://www.detroitnews.com/story/news/local/wayne-county/2015/03/26/inkster-motorist-arrest/70478874/. For account of police killings nationally since beginning of 2015, read http://voiceofdetroit.net/2015/03/13/2-cops-shot-in-ferguson-after-police-in-u-s-kill-3-people-a-day-since-2015-began/. 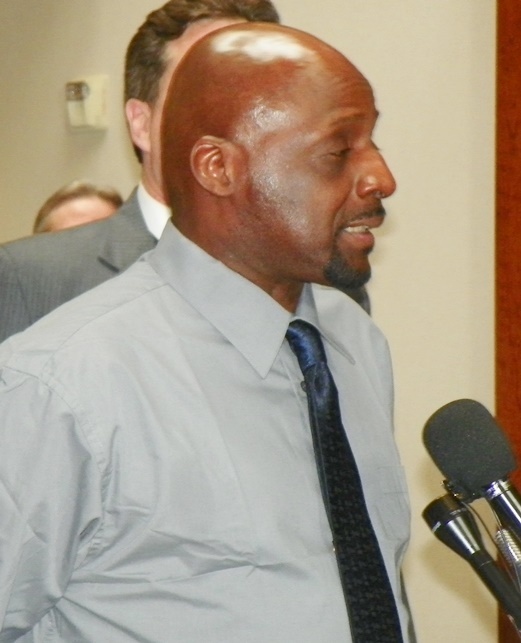 Floyd Dent speaks at press conference March 25, 2015. 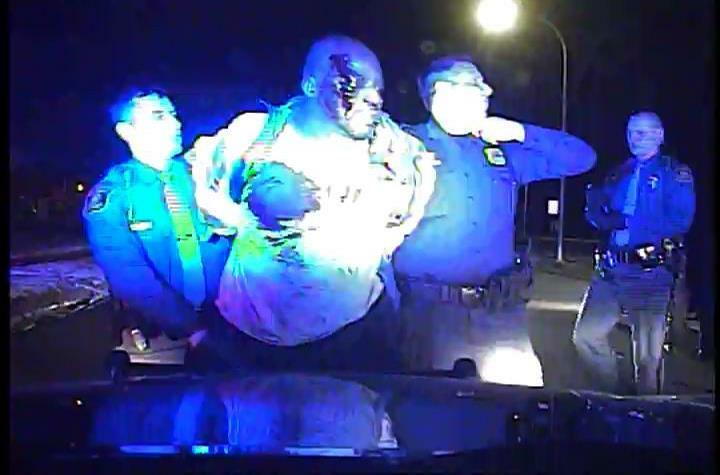 Inkster, MI – Former Detroit “Robocop” William Melendez has re-surfaced in Inkster, star of a police dash-cam video that shows him punching Black Detroit motorist Floyd Dent, 57, in the head 16 times while confining him in a chokehold January 28. Then a gang of white Inkster cops are shown tasing Dent, and beating and kicking him as two white State Troopers look on. “Why are you doing this? What did I do?” Dent cries out as he is thrown up on the hood of a police car, bloodied and battered. Dent has been a Ford autoworker at the Rouge plant for 37 years and is a member of UAW Local 600. He was visiting a blind friend in Inkster when stopped, according to his attorney Gregory Rohl. He has no criminal record. 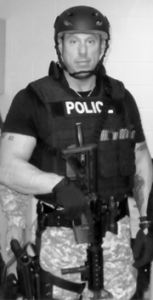 Robocop Melendez in SWAT style armor. Rohl said Dent sustained injuries including a fracture of his left orbit (around his eye), subdural hematomas (bleeding in the brain), and four broken ribs. He was charged in Inkster District Court with assault and battery on Melendez, two counts of resisting and obstructing police, and possession of crack cocaine. After viewing the videotape, an Inkster judge dropped all charges except the drug charge. “I saw them plant the drugs in my car,” Dent said. “An innocent man does not plead guilty.” Meanwhile, his car has been seized by the Inkster Police department. Dent tested negative for all illegal substances. Melendez and the other officers involved were not themselves tested. Rohl said the Inkster police force is 95 percent white. Inkster is 73.2 percent Black, according to U.S. Census data. Rohl said he has asked for an investigation by the U.S. Department of Justice into the beating. 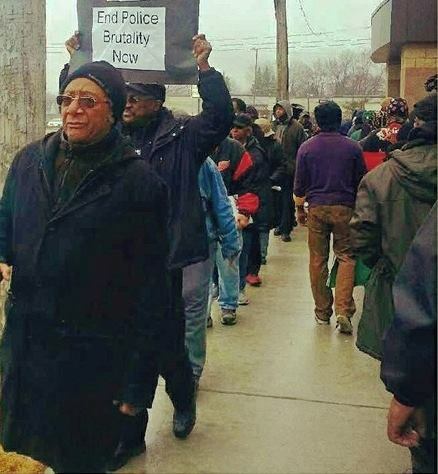 Earlier, protesters from the National Action Network picketed outside Inkster police headquarters, with some threatening to shut the city of Inkster down. Inkster’s Police Chief is former Detroit cop Vicki Yost, also white, shown in the video above. She moved on to that position after numerous promotions in the Detroit Police Department subsequent to her participation with her partner Eugene Brown in the killing of Lamar Grable, 20, in 1996. Grable’s sister Arnetta Grable, Jr. and Cornell Squires, of the Original Detroit Coalition Against Police Brutality, shown above, attended the press conference. 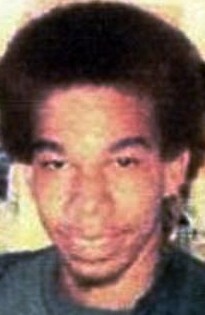 Squires’ son was framed up by Melendez in 2000 for attempting to carjack him and Officer David LeValley, with a gun that was never found. The two were in plainclothes. During a civil trial, Brown admitted to chasing and shooting Grable eight times, including three times in the chest as he lay on the ground. Police reports saidt Yost, who was in close proximity to the shooting, took the gun they claimed Lamar fired at Brown home overnight before she turned it into the police lab. Eugene Brown killed (l to r) Rodrick Carrington in 1995, Lamar Grable in 1996, and Darren Miller in 1999. After hearing testimony from Brown and Yost, countered by testimony from noted medical examiner Werner Spitz that Grable was “executed,” a civil jury awarded Grable’s family $4 million in 2003. The verdict was upheld at the appeals and Supreme Court levels. Preceding Yost in her position, which she assumed in August, 2014, was Hilton Napoleon, brother of Benny Napoleon, acting Detroit Police Chief in 2000. Benny Napoleon ditched an internal report on Brown which recommended criminal charges be brought against him, but the Michigan Supreme Court later ordered it disclosed. Melendez has been sued in federal court as least 12 times, with an early lawsuit involving the execution-style slaying of Lou Adkins, unarmed, on Detroit’s southwest side. Melendez and his partner shot Adkins 11 times as he lay on the ground after a traffic stop. The most recent lawsuit involves an incident in 2011, during his tenure with the Inkster Police Department. 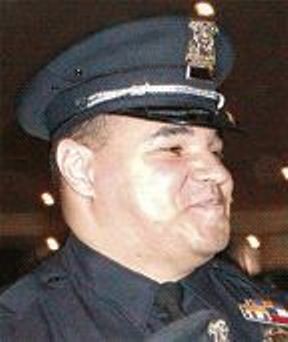 Separately, the U.S. Department of Justice indicted him and 17 other Detroit cops in 2003 for a “Ramparts”-style campaign in the Third and Fourth Precincts. Witnesses testified that the officers planted guns and drugs on them, beat them, sexually abused and strip searched them, threatened to kill them, and then falsified reports and lied in court. The USDOJ called Melendez and Matthew Zani the “ringleaders” of the group. The indictment said Melendez had threatened to kill one witness if he testified against him. Melendez (left) grabs Dent in choke hold that nearly suffocated him, and beats him in the head 16 times. Dent is clearly trying to protect himself. Floyd Dent, blooded and seriously injured, thrown on top of police car. During the press conference, Dent, who has two children and two grandchildren and is currently engaged, described the beating by Melendez and Inkster cops in detail. Dent said the brutal treatment continued as he was thrown in a police car and driven to the hospital, where he was chained to his bed and not allowed to use a urinal, under police guard for three days during which his family was not allowed to visit him. He added that “it’s been hard to go back to a normal life” since the incident. He is currently on medical leave from his job. Floyd Dent and attorney Gregory Rohl, with Dent’s family members behind the, address the media March 25, 2014. 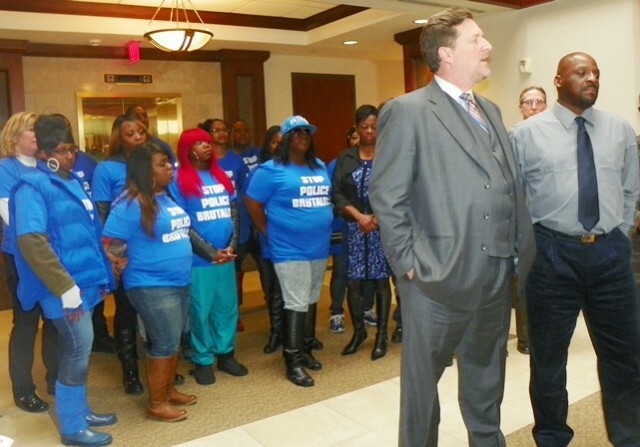 Dozens of Dent’s family members attended the press conference, wearing shirts demanding, “Stop Police Brutality,” but were barred from commenting by his attorney. An aide in Rohl’s office told VOD that although Yost told Channel Four on camera that she contacted the Michigan State Police immediately to investigate Rohl’s beating, Yost was not being truthful. The aide said when she contacted the MSP during the law office’s investigation well after the beating, she was told they had just received a referral from Yost. 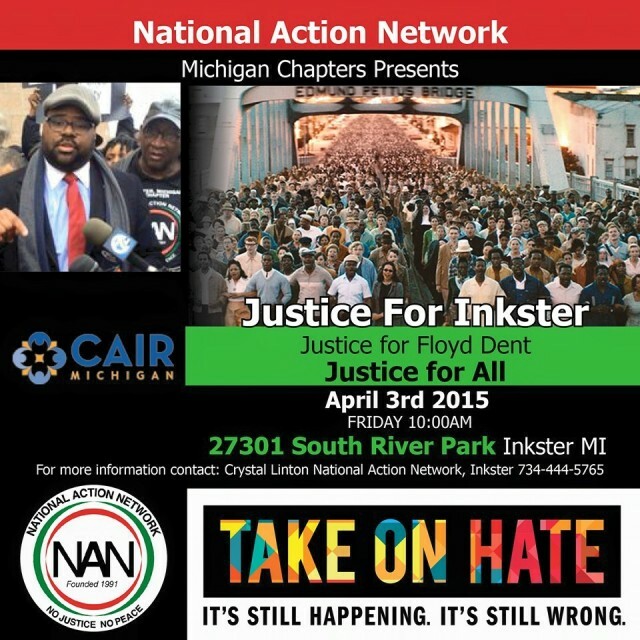 National Action Network of Michigan recruited Inkster residents to march for justice for Floyd Dent outside Inkster Police HQ March 25, 2015. The aide said she was “amazed and flabbergasted” at Melendez’ arrogance when he testified during Dent’s preliminary examination. She said he winked at her as she left the stand. 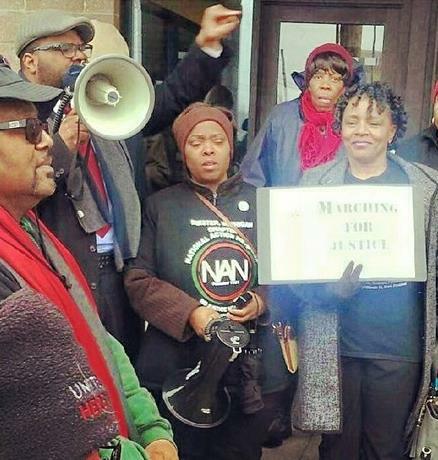 NAN protesters outside Inkster police HQ March 25, 2015. Melendez then reports that Sgt. Kritzer pulled out his Tazer gun and shot it at Dent three times, with Dent pushing it aside twice, until a “third dry stun” took effect. 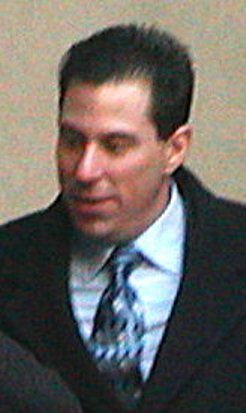 He said Police Officers Arnica and Randazzo approached, and Randazzo kicked Dent in his right arm. In the report, Melendez’ race is reported as “White,” although he is biracial, with one Latino parent. Rohl noted during the press conference that the video gives the lie to Melendez’ report, since there is an interval of only 2.6 seconds between the time Dent is stopped and the time he is dragged out of the car. There is no evidence on the video of Dent resisting arrest, only trying to remove Melendez’ arm from his neck. Dent said he was about to take his last breath. After the press conference, Arnetta Grable, Jr., also known as A.J., vowed to organize youth and others across the country to build a new world that her six-year-old son, named Lamar after her brother, can safely grow and prosper in. 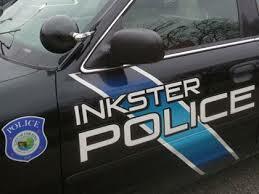 Inkster Police Dept. 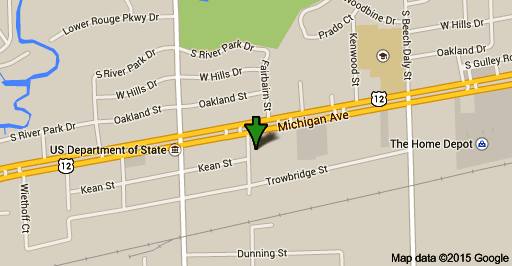 at 26279 Michigan, Inkster, between Beech Daly and John Daly, west of Telegraph.